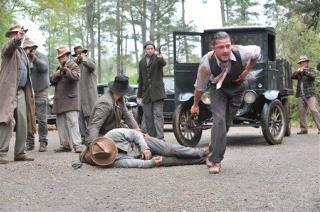 (Newser) – Critics are weighing in on one of the last big summer movies, Lawless, which interprets the true story of the Bondurant Brothers, who were bootleggers/gangsters in the Prohibition era. Reviews are mixed—65% approval at Rotten Tomatoes—but most critics seem to put it in the good-but-not-great category. Writing for Slate, Dana Stevens says that despite an excellent period set and talented cast (except for "too much" Shia LeBeouf), "Lawless never quite attains the mythic grandeur it seeks" and that the end result is "overstuffed" and "underbaked." Peter Travers at Rolling Stone agrees. With a "dynamite cast" and lauded director John Hillcoat, "you assume a new classic. What you get is an ambitious try." Still, he says, compared to some of the other movies out this summer, "you could do worse." Sean P. Meyers of the Salt Lake Tribune had better things to say: "If you don’t get drunk off the moonshine flowing through Lawless, you’re likely to feel a bit light-headed breathing in the atmosphere of director Jeff Hillcoat’s engaging period drama." Guy Pearce is getting the most across-the-board praise for his depiction of the villain, Chicago lawman Charlie Rakes. Marjorie Baumgarten, writing for the Austin Chronicle, says his performance "becomes the film’s most memorable turn." what is the big deal here? only a movie dumb or not. SLO NUZ DAY FILLER!